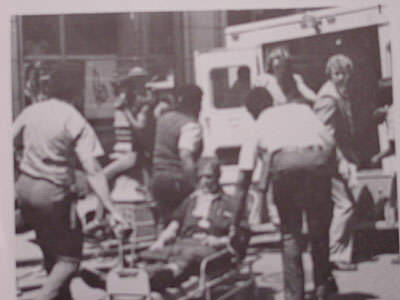 On June 11, 1982 an angry man entered the Buhl Building in Detroit Michigan. His attorney was handling an insurance matter for him and the man wanted his check. It was for $2500 and the man intended to get that money or seek vengeance. He rode the elevator to the eighth floor. When he entered the lawyer’s office he was carrying a sawed off shotgun and a gasoline fire bomb. Whatever occurred from that point on is uncertain. The man shot a woman and threw the fire bomb against the office wall. 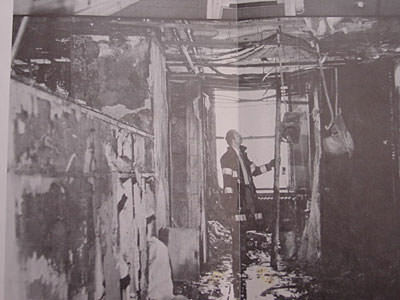 The ensuing explosion and fire scattered the occupants of the eighth floor. Many ran to windows cut off by the raging fire. Some were caught in the smoke filled hallways. The fire alarms went off and the Fire Department sent Firefighters to the scene. Panic gripped the eighth floor of the Buhl Building. Engine 1s crew went to the fire floor and began rescuing people under heavy smoke conditions. The screaming of the trapped civilians added stress to the situation. The Firefighters found and removed five people. The men got a hose line working and began to put out the fire. People fleeing the mad man, with the gun, had run into several different rooms. Police officers working with the Firefighters were able to locate the shooter and take him into custody. When ladder 1 pulled up they could see people hanging out of windows on the upper floors of the Buhl building. Some victims were on the street side and others were trapped in rooms overlooking a roof four floors up at the side of the building. Ladder 1 was hampered by double parked cars. 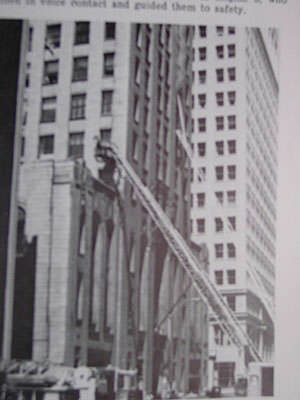 When they extended the 100 foot aerial ladder they were one floor short of the trapped victims. The Captain of Ladder 1 ordered a ladder splice operation. This is a rare tactic but it was necessary under the fire conditions at the scene. Several Firefighters took up a sixteen foot roof ladder and placed it on the upper rungs of the aerial ladder. The roof ladder was secured with leather belts. 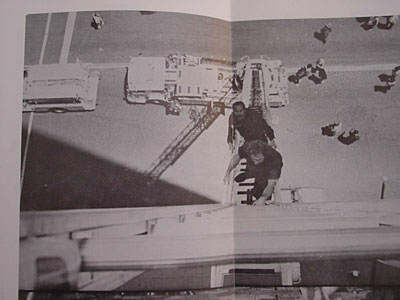 The men proceeded to help victims out of the window and down a precarious set up eight floors above the street. Ladder 3 arrived on the scene and raised their aerial to the roof at the side of the building. 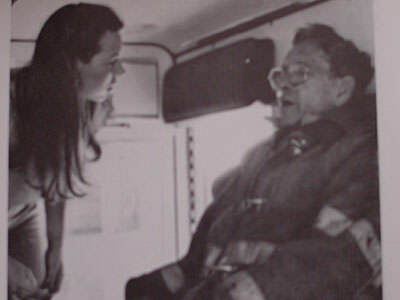 Arriving Firefighters urged the trapped victims to hold on. Two people had already jumped four floors and hit the roof next to the Buhl Building. A heavy 50 foot extension Ladder was brought up and Firefighters were able to rescue the people who had made it to the windows. There were many acts of heroism that day. Inside the fire one Firefighter shared his air mask with a panicking police officer. That Firefighter ended up in the hospital with smoke inhalation. The fire sent five Detroit Firefighters to the hospital. The total for the Buhl Building fire was one dead and 38 injured. 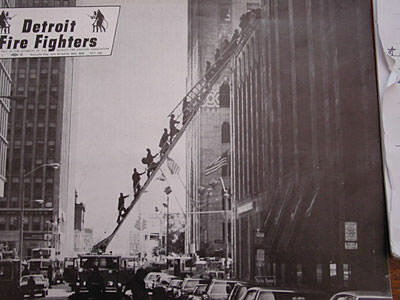 Only the unselfish brave actions by Detroit Firefighters saved the day and prevented a greater loss of life. 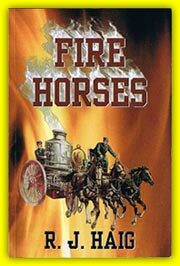 It was one of the most complicated and heroic fire evacuations in the history of the Department. The photos below are from the Detroit Fire Fighters Magazine which is published by Local 344 the Detroit Fire Fighters association. The pictures were taken by Bill Eisner, Bill Grimshaw, and Detroit Police Photographer Babcock. Notice the splice ladder atop the aerial. Taking up the 55' extension ladder. What trapped victims had to go down. Arson investigates Buhl Building fire. Firefighter to the hospital from Buhl Bldg fire. A Firefighter sits in the ambulance after the Buhl Bldg fire.